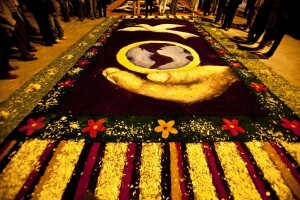 Holy Week in Ayacucho is one of the most significant religious festivals nationally and worldwide, characterized by maintaining its own uniqueness and performing its predilection with deep religious fervour that makes it unique and different. 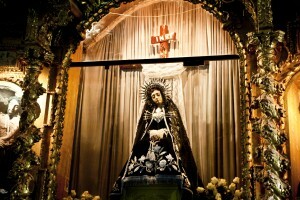 Originally celebrated in Spain, represents sacrifice and death of Jesus in the Calvary. 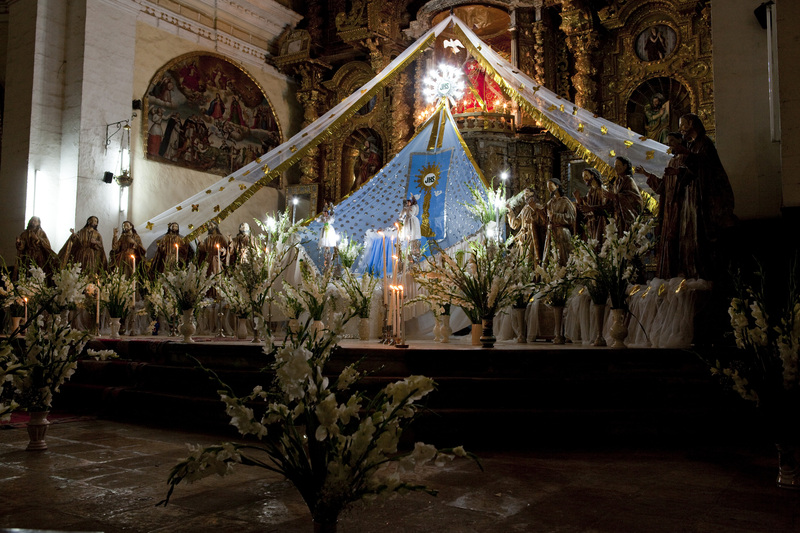 The Andean city, Ayacucho, has 33 churches, each one representing a year of Christ’s life. While that could be enough to demonstrate Ayacucho’s devotion to Christ, this article won’t stop at that. In addition to the religious services, Ayacucho’s Semana Santa celebrations include art shows, folk-dancing competitions, local music concerts, street events, sporting events (especially equestrian ones), agricultural fairs and the loving preparation of traditional meals. 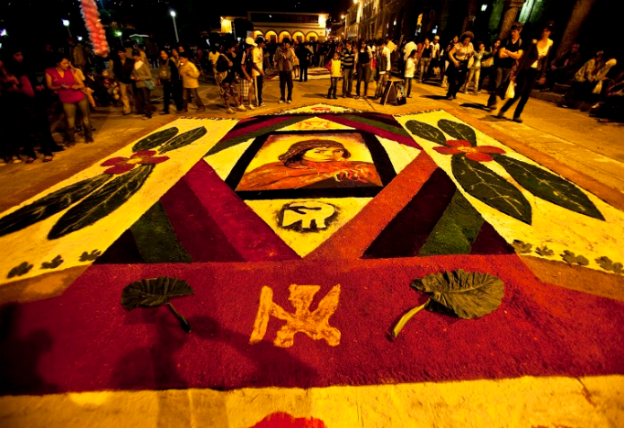 Without a doubt, the ideal destination in Peru to celebrate the Easter weekend is Ayacucho. Every year, for 10 days the city is consumed by the holiday, and it all begins on the Friday before Palm Sunday, which falls on March 20th this year. Where thousands of people from all the country and foreigners arrive to Ayacucho to participate of the religious devotion of these people. People from the surrounding cities arrive in caravans to Ayacucho. Months in advance, the entire Andean city, also known as ‘Huamanga’, is deep into organizing the week-long holiday. The city builds enormous structures: artists create rugs or blankets of flowers oriented to depict religious and traditional scenes: candlelit processions overwhelm the streets with thousands of worshippers: dances are choreographed and bulls are prepared for traditional and dangerous rites. What happens during Palm Sunday until Easter Sunday? 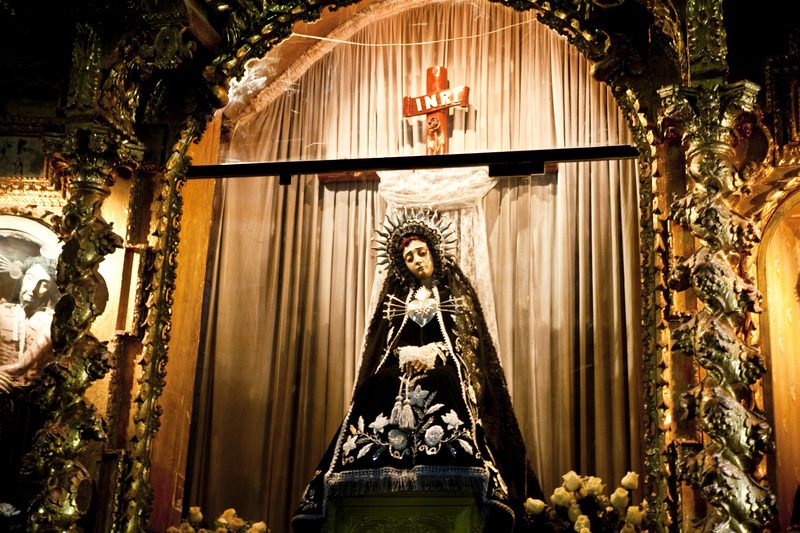 Marked by a procession in honor of La Virgen de los Dolores (Our Lady of Sorrows), during which it is customary to inflict ‘sorrows’ on bystanders by firing pebbles out of slingshots. Gringos have been targets, so be warned. On the first Sunday named Palm Sunday, “Domingo de Ramos”, the city recreates the arrival of Christ to Jerusalem. This is considered one of the more festive days in Ayacucho’s Holy Week. Very early in the morning, donkeys and llamas, with palms from the area, enter the city. Local people as cheerful revellers wave palms celebrating the image of Christ arriving on a mule to the city’s main plaza. At about the same time, from church of Santa Teresa, the image of Christ on a donkey leaves in procession, accompanied by a vivid representation of the twelve apostles. The image of Jesus is venerated. All the pilgrims surround the image holding candles in their hands, and in that moment, the light from the city is turned down. 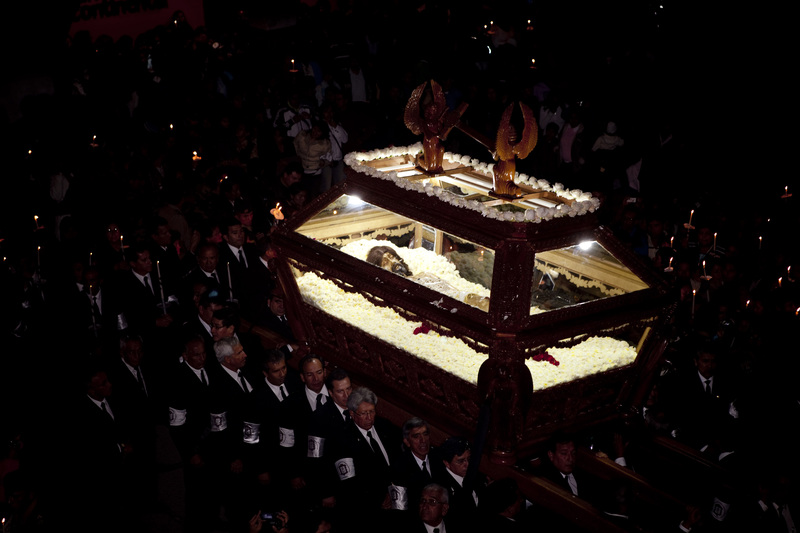 Images of some other saints, taken from churches of the area, accompany this procession. As is traditional, on Holy Thursday, people do their visit to 7 of 33 churches of the city. The most visited are San Juan de Dios, San Francisco, La Merced, La Compañía de Jesús, San Francisco de Paula, the Cathedral, and the temple of Santo Domingo. The route can be made on foot because all the buildings are in the historic centre. The tradition is that the children carry a bottle to collect holy water from the seven places. that the residents prepare from the early hours of the morning. 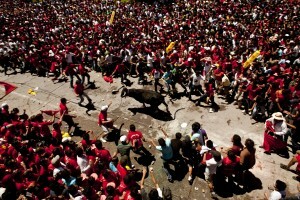 On Saturday, there’s a traditional trade fair called Pascua Toro. It’s a popular custom that represents the interchange that occurred between the upper class and the villagers during the times of the colonisation. In that time, the well-to-do families donated bulls to the poor, so that they could eat over Easter. Nowadays, the bulls are gifted to charitable institutions. 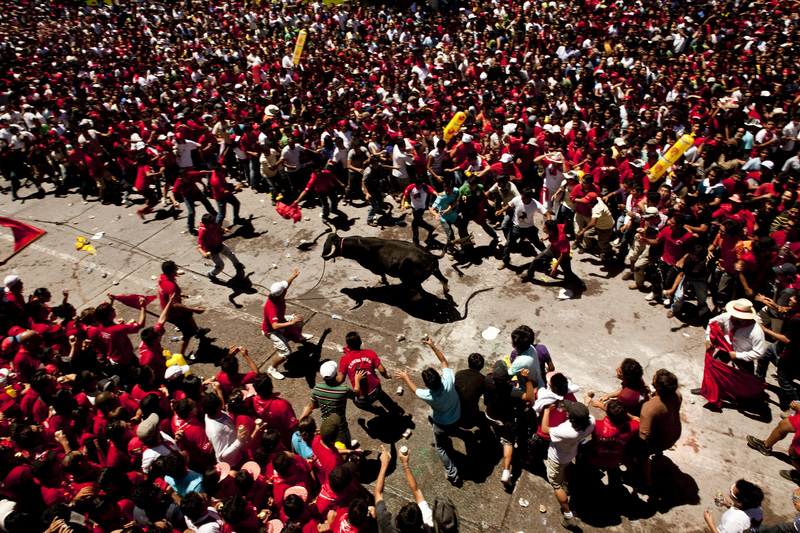 The gala is the transfer of the animals to the Plaza de Armas and “Morochucos”, riding on Peruvian horses, musicians, and crowds vibrating in its path. The celebration ends with a huge all-night party including dawn fireworks to celebrate the resurrection of Christ. If you want to party too, there is chances to meet local people and have a great time. Then, on Sunday all the people wake up with the ringing of the bells from all the churches in Ayacucho. After that they go to the Cathedral, carrying out a very big image of Jesus brought back to life, this image is carried by more than 250 men. They go around the city, with many pilgrims, giving end to this special Holy Week. Ayacucho is a blossoming city in the central-southern Andes screaming with pride. And there’s no better time to witness it in all its glory than during Holy Week when the city puts all its cards on the table. The journey from Lima takes 10 hours by bus or an hour by flight. Accommodation and dining costs are quite accessible. The Spanish conquistadors brought clergy and missionaries to Peru’s lifestyle, and with it came his religious culture and moral teaching on human love. Among them, the religious holiday of Easter was gradually introduced during the process of evangelization in the historical period of the colony. Once Huamanga was founded in what was the seat of the Holy Week Pucara played a very important role in the incorporation of indigenous religion and the Catholic Church. Although initially this religious holiday should conform to Indian tradition, was gradually welcomed by them. Get in touch with us at info@perusportstravel.com or visit our website to get a free quote.